Halo, the made for iPhone hearing aid by Starkey, is truly a revolutionary technology when it comes to hearing healthcare. These hearing aids are controlled using the Trulink iPhone application which helps to transforms the hearing aids into a true listening experience. 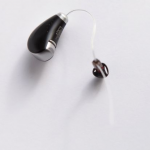 It allows the patient to take control and personalize the hearing aid sound quality to improve clarity and comfort in a multitude of complex and noisy listening environments. The sophistication of this technology allows the patient to assign the sound personalization to a specific location, such that any time the application recognizes that that patient has entered that same location (i.e. a favorite restaurant), the hearing aids automatically adapt to those previously adjusted settings so that ease of listening continues seamlessly. In addition, the Halo allows patients to wirelessly stream phone calls and audio signals (i.e. music and movies) to their ear level hearing aids without any intermediary device, which has not been possible before. Halo allows patients to take control of their hearing needs in their every day settings. A hearing aid fitting between the patient and audiologist is typically performed within a quiet, ideal listening environment, thus giving technologically savvy individuals the controls to adjust sound, in real-time, is one of the greatest benefits of this multi faceted application. A tiny hearing-aid receiver, which rests on the ear. A free app called TruLink™ Hearing Control, which you can download from Apple’s App Store. The app works on the iPhone, iPad or iPod Touch. Using special technology, the hearing aid and app help you hear conversations more clearly, enjoy music better and block out noise and feedback. But don’t worry if you’re not an app-lover: The Halo™ device, created by Starkey Hearing Technologies, also can work on its own. The device is designed to minimize buzzing, whistling and other interference, making even crowded restaurants, busy subway stations and noisy shops more manageable. The first step to finding your ideal hearing aid is having a consultation. You can give us a call to schedule, or make an appointment request online. At your appointment, you’ll answer questions about your current needs and your health history, as well as take a hearing evaluation. If you’re interested in the Halo™ hearing aid, we’ll discuss how it might fit into your lifestyle. Disclaimer: Face-to-face personalized office visits with the audiologist are a critical component to the hearing aid process. The Halo hearing aid and TruLink iPhone application will not replace visits with the audiologist.